Whimsical is rarely a word used to describe chamber music, but for RUDuo, it’s an appropriate one. The Richter Uzur Duo has played hundreds of concerts throughout the world and a widening circle of communities around the globe invite them back again and again for a whimsical mashed-up blend of classical, world and rock music. 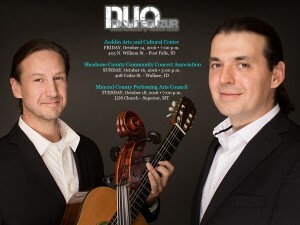 The Duo approaches the concert stage with effortless virtuosity, soulful musicality and self-effacing humor.